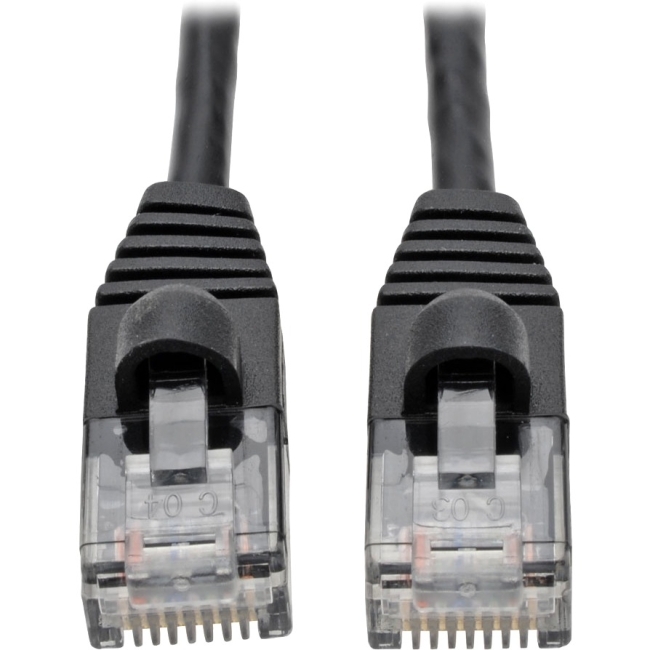 the N261-s06-bk Cat6a Gigabit Snagless Molded Slim Utp Network Patch Cable (m/m) Is Ideal For Connecting Network Components Like Computers, Servers, Routers, Printers, Patch Panels And Switches In High-density Data Centers. Designed For Fast Transmission And Excellent Signal Quality, This Six-foot Black Cable Ensures Peak Performance Throughout Your Local Area Network (lan).manufactured From 28 Awg Copper Wire, The Four-pair Stranded Utp N261-s06-bk Delivers Gigabit Ethernet Speeds Up To 10 Gbps. Protected By A Pvc Jacket, This Cable Is More Than 38% Smaller In Diameter Than Standard Cat6a Cable, Which Increases Airflow In Tight Spaces And Makes It Easier To Install Around Corners And Through Cable Management Panels.rj45 Male Connectors Are Conducive To An Accurate Signal Transfer, Improving Near-end Crosstalk (next) Performance To 650 Mhz. The Snagless Design Protects The Locking Tabs Against Being Damaged Or Broken Off During Installation. Integral Strain Relief Gives The Cable Extra Flexibility, Reduces Stress, And Helps The Cable And Connectors Move Freely Without Cracking.each Cable Has Been Tested And Certified Using Fluke Test Equipment. Test Results Are Available Upon Request. It Supports Ieee 802.3af, Is Dte Power Compliant And Is Compatible With T568a/t568b Wiring.